We read The Gruffalo last year after I discovered it's one of Trenton Lee Stewart's favorite children's books. It became an instant hit in our household. In the end, I am satisfied with the risk. The story does follow the book remarkably well. It takes all of five minutes to read this fun story about Mouse who goes for a stroll in the deep, dark woods. In case the story is new to you, Mouse is approached by various animals who invite him into their homes for lunch. He is invited to lunch by a fox, an own and a snake. But, as Mouse explains, while he appreciates their very, um, kind invitations, he really must decline because he's going to have lunch with a Gruffalo. Of course, silly old things, they don't know that Mouse is making up stories about "a terrible beast with knobbly knees and turned-out toes and a poisonous wart at the end of his nose"! 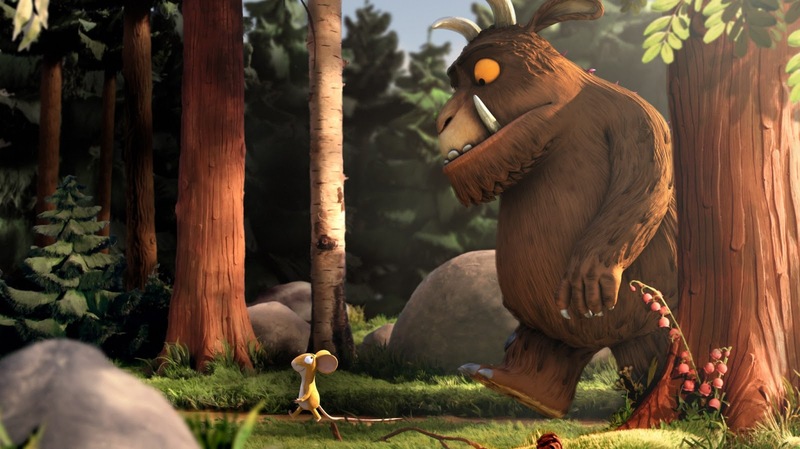 In the end, it's hard to say which creature is more surprised to discover that the Gruffalo is a real creature! The movie version of The Gruffalo is 30 minutes long. How on earth did they take a 5 minute picture book and turn it into even a 30 minute show, you ask?! In a very clever way. That's how. The script of the movie follows the book. There are very few original lines in the movie. The story opens with two young squirrles running through the forest. They turn to their tree home and ask their mother for a story about either a monster or a mouse. The mother squirrel begins telling the story which we are now greatly familiar with: "A mouse took a stroll through the deep, dark wood..."
Although the movie script sticks to the book, it embellishes with facial expressions. 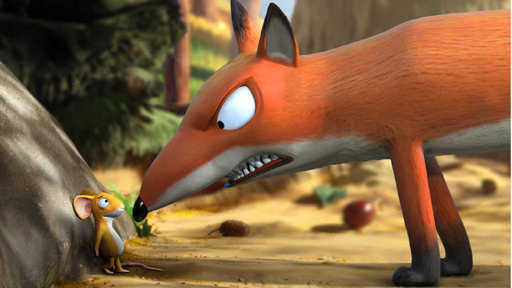 The fox leans in close to the mouse and threateningly invites him to lunch. The mouse stammers and stutters and tries to think of an excuse to decline the invitation. He takes a minute or so to come up with the concept of a Gruffalo and the fox buys it. We see the fox's reaction to news of the Gruffalo in terms of exaggerated expressions which help to illustrate, if you will, the original text. Additional time is gained by us walking with mouse through the forest, watching owl fly down from the trees, the snake slither through the grass, and so on and so forth. Then, of course, the Gruffalo himself must be examined on screen. The only additions to the book come in the form of the squirrel family who begin the tale as if they are telling a story. Also, the owl, the snake and the fox have a brief meeting together in the woods in which they ask themselves, "What IS this creature called the Gruffalo!?" Otherwise, the film stays true to the book in every regard and I can think of nothing to complain about. It's remarkably well done. The story is illustrated with CG and CGI. Interestingly, Legos were even used in the production of this film! 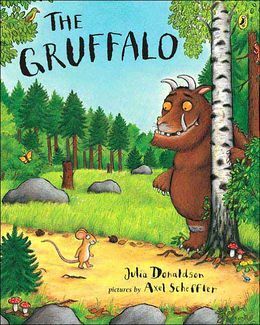 Here is an article which talks about the making of The Gruffalo , which was originally aired on the BBC in 2009. I have no problems recommending The Gruffalo movie . Especially not if you like the book! There is a sequel to this called The Gruffalo's Child . I don't know that we'll be watching that one. At least, I haven't talked myself into it quite yet. Also, if you haven't yet read the book, may I recommend it to you again? I hadn't heard of either the book or the movie, but they sound charming! I wasn't familiar with this title, either, and will have to see if our library has it. We adore that book!! (Even Jonathan does!) I'll have to look for the movie. Both the movie and the book sound really cute. Kind of reminds me of The Big Hungry Bear and the Red, Ripe Strawberry.